You know my heart and the struggles I've faced with anxiety. The anxiety has a root cause: my inability to wait. I have trouble waiting for life to be easier. I wait for the kid's eczema and food allergies to go away. I wait for difficult relationships to get better. I wait to hear where we will end up next. I wait for the next place to live. I wait for the days that are the hardest to get through to get easier. Instead of waiting on life and everyday things to happen, I pray you give me the strength to wait on your timing. I need to remember that the time I wait isn't wasted time. Help me to know that the time I wait for you to help me with life's battles is the time that I should live in the moment. Don't let me stress about the past. Don't let me worry about the future. Just as you ask us to look at the birds of the air, help me to do the same and not worry about tomorrow. A few weeks ago, a Bible verse challenge popped up on Facebook. Several people were challenging others to post their favorite Bible verse. One thing that really stood out for me was that the main verse that I read that other's posted was one about being anxious. Philippians 4:6-8 Do not be anxious about anything, but in every situation, by prayer and petition, with thanksgiving, present your requests to God. And the peace of God, which transcends all understanding, will guard your hearts and your minds in Christ Jesus. Finally, brothers and sisters, whatever is true, whatever is noble, whatever is right, whatever is pure, whatever is lovely, whatever is admirable- if anything is excellent or praiseworthy- think about such things. A thought crossed my mind as I noticed how many people wrote this as their favorite verse. So many of us suffer from anxiety. According to the ADAA (Anxiety and Depression Association of America), "Anxiety disorders are the most common mental illness in the U.S., affecting 40 million adults in the United States age 18 and older (18% of U.S. population). (http://www.adaa.org/about-adaa/press-room/facts-statistics). I imagine that even more than that go undocumented. With all of the busyness and everyday life stresses, it's no wonder we spend so much time worrying and filling our hearts with anxiety. If you see someone going through a hard time, how about using kindness around them? I know when I'm going through rough patches, someone's kind words can truly lift me up. Imagine what that can do for that person. Kindness wins!!! Go straight to God, share all that is on your heart, and ask for His help. He really does care for each one of us and whatever we are facing in life. Perhaps, we have sin in our life that we are guilty of that we know we need to seek forgiveness, whether from someone or from God. Seeking that forgiveness can also help with the anxiety you are facing. 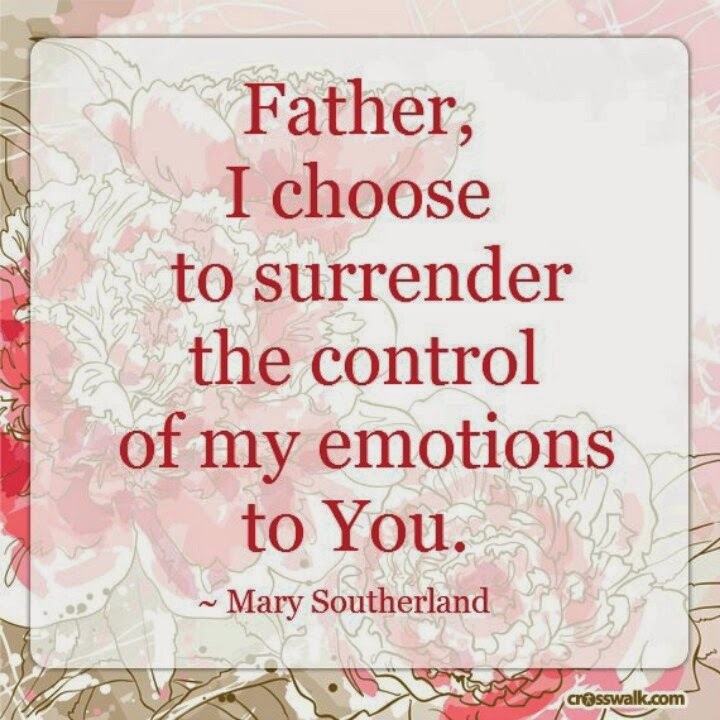 Getting rid of the guilt from that sin will help with the anxiety. Psalm 46:10 He says, “Be still, and know that I am God." Sometimes, we just need to be still. We have so much going on that we need a time-out from all that we have going on around us to be still and spend time with God. We need to go to a quiet place with our Bibles and listen to what He wants to tell us. Something else we can do is seek rest. I don't think we get enough rest sometimes. We go, go, go until we fall apart. I know I do. I am thankful I have a husband that can sense when I start to fall apart. He pretty much has to demand that I go somewhere to get a coffee or go lie down. I can be pretty stubborn sometimes about seeking rest. I don't want to take it until this or that is done. But I can't accomplish everything. It isn't possible... ever. There will always be something more to do. So why not stop and take time to rest? The rest that I get always helps. I think having someone who you can go to talk to about whatever is pressing on your heart helps tremendously. Find someone full of wisdom, whether it be a family member, pastor, neighbor, or friend. Share with them how you feel. Find the right person who is willing to just listen and carefully give you wisdom. Finally, instead of waiting with anxiousness, we need be strong. Waiting doesn't have to be a bad thing unless we spend time worrying about it. If it is not in God's timing, we must wait. God may not be ready yet to do whatever we are asking or hoping for Him to do. And as we wait, we need to focus on the time we are in now. If we focus too much on the future we will miss what is happening right in front of us. If we dwell on the past, we will just make things worse. Once we get out of that state of anxiousness, we can find that joy that we need again. And what a great feeling that is to have that joy! Blessings to you and yours, sweet friends! Hey you! Yes, you! The one with the coffee-stained teeth and blood-shot eyes from lack of sleep. I'm talking to you. The one with stretch-marked skin from being pregnant. The one who stepped out of the shower with no time to fix your hair. The one who had places to go but forgot to brush your teeth. The one who just needed to shave your legs or maybe shaved a little too quickly cutting yourself. Guess what? You are beautiful! Stop buying those magazines in the store where the pictures have been Photo shopped to make a sale. Turn away from those ads on TV that promise you'll look a certain way if you buy into their program. Ignore the devil putting jealousy into your heart because someone else got to go on vacation or their baby walked earlier than yours did. Quit stepping on the scale and beating yourself up about every little pound. STOP COMPARING YOURSELF TO OTHERS! Mainly, it's our own negative train of thoughts that can affect our thinking. If only I lost a few more pounds, then I'd be happier. If only my kid could read like my friend's kid whom she bragged about on Facebook. If only my house looked immaculate like that one. If only, I could just be more like someone else. If only I could look like someone else. If only we had more money than we'd be happy. If only my husband helped around the house more like so-and-so's husband. If only I could eat the perfect, healthiest meal instead of making a quick box of mac n' cheese. 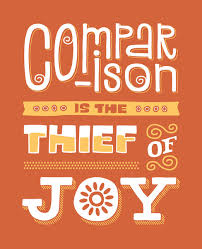 Constantly comparing ourselves to others is only going to break you down taking your joy away. But it doesn't have to be this way. Why can't we be happy with how God made us, stretch-marked skin, coffee-stained teeth, hairy armpits and all? Why can't we be thankful for life as we know it even when times are tough? When we complain about our looks, we are essentially complaining about the way God made us. When we compare how our lives are going to the person next to us, we miss out on so much. Boy, do we get it all wrong sometimes by comparing. I know I do! Psalm 139: 14 I praise you because I am fearfully and wonderfully made; your works are wonderful, I know that full well. What if instead of being jealous that our friend's child can ride their bike at age three, we can be thankful that their child has an adventurous spirit? What if instead of comparing the way our body looks after having a baby to someone else, we stand in awe of a God who gives us a body that can do so many amazing things? What if instead of wishing for the perfect Pinterest house we could be thinking about giving more of our money towards a third-world country? What if instead of wishing we could make every meal from scratch, we were thankful we ate today? The world wants us to think differently. The world tells us to buy into the promises that if we looked, acted, and felt a certain way, then we'd be happy. It says so on the cover of those magazines in the checkout lane. It says so when it tells us that we will be happier if our kids are doing x, y, and z. It says so when we think we aren't doing enough like that other person over there. It says so when it feeds the minds of so many to follow it's path. But it's not God's way! God's way says that we are "wonderfully made." God's way says our children are His blessings and all that we own are His blessings too. God's way tells us not to have "treasures on earth but treasures in heaven." God wants us to be "thankful under all circumstances." I often wondered if the Israelites played the comparison game in the desert those 40 years about eating the same food and being on a difficult terrain. I can just hear it now. Their complaining was probably like, "If only I could eat a lamb right about now and enjoy some wine. Instead, I have to eat this quail again. I wish I could be an Egyptian and enjoy a grand feast. Their clothes are fresh and fancy with all the latest colors. My clothes are filthy and I've got more dust up my nose than I could ever imagine. Plus, they get all the comforts they could ever imagine. I get to go sleep on this rock again." I think we'd be much happier if we could look for the good in every situation instead of finding something wrong. Comparison is a big waste of time. I want to encourage you to cling to God when you feel the urge to start comparing yourself. Remember who He created you to be and give Him praise. He is worthy of all of our praise. And thankfully, we don't have to worry about being perfect. God finds you pretty amazing and that is more than enough.